The D-Bird Custom has been a popular addition to the Dingwall lineup. The D-Bird Standard is a cost-effective version of this classic design using a mahogany body with smoked nickel Hipshot/Dingwall hardware. Choose from four stunning finishes. PLEASE NOTE: While the D-Bird Standard model is manufactured in China to our exacting specs, when they arrive here in Canada each bass goes through a rigorous two hour quality check including all the electronics, fret leveling and final setup. These basses don't leave our Canadian shop till they are up to our high standards. *Available in 4 string model only. Mahogany body, smoked nickel Hipshot/Dingwall hardware. The average weight of the D-Bird Standard is a low 8.5 to 9.5 lbs. The Gloss/Matte D-Bird Standard finishes are a polyurethane color and top coats. This industry standard finish is long-wearing and beautiful for years of service life. Headstock design - flat. We designed a downsized tribute headstock with Hipshot Licenced Ultralite tuners. The results are excellent balance and solid performance. 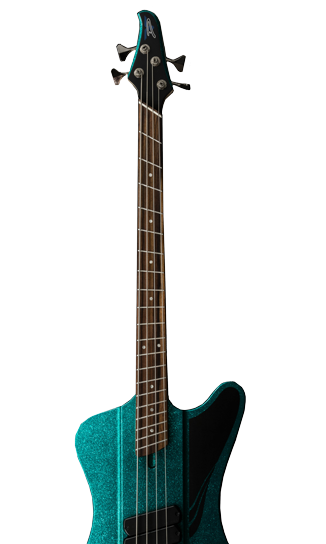 The D-Bird Standard bass features a single radius (240 mm) fingerboard. This makes for a very comfortable playing experience. The D-Bird Standard now features Smoked Nickel knurled dome style knobs with a set-screw. The jack is one of the most critical electronic components of a bass. It’s the most likely to suffer abuse so needs to be rugged in order to be reliable. We wanted the D-Bird Standard to be as reliable as it is great sounding and looking so we install the traditional style jack plate with a Switchcraft brand jack. We tested a lot of tuners when designing the Combustion. We were able to find an open-back tuner that met our requirements of light-weight and smooth feel. These tuners will provide years of trouble free performance. We also chose them to have the exact same hole specifications as both Gotoh and Hipshot tuners so replacement or upgrades down the road are a simple process.